Odd humming metal boxes have appeared on an Oregon beach, occasionally glowing or screeching. They are so heavy they cannot be moved by curious humans discovering them, and in a location that cannot be reached by container ships. There are no tracks, no markings, and they are sealed so tightly they cannot be opened. Per a channeled report on the Micro Effect radio, these are alien, and intended to suppress earthquake and volcanic activity. I listened to the trance ET channeler Alma Guthrie tonight, 02-13-2012, at midnight EST on Robert Pepino's The Whole Agenda show on the Micro Effect network and she said the boxes are ET devices put from Alaska to Mexico to even out the pressure of earth changes, discharge plate energy else the volcanoes and terrain would be devastating and devastated. She said some have been taken by the US and are being secretly studied. She said these boxes are placed on the fault lines to vibrate to release pressure of the tectonic plates gradually; to not allow them to build up. The implication is that the government has some of them but they 'disappear' before they can be examined. They can't be moved; even when yanked by a four-wheel drive truck pulling on heavy chains tied around these humming metal boxes that are still appearing as of Feb. 8 up and down West Coast beaches. The photograph that accompanies this report - taken during the afternoon of Feb. 8 near Bray's Point - of yet another strange metal box stuck in the surf up is one of a possible group of a dozen or more that have been sited up and down West Coast beaches. Meanwhile, the British government also photographed similar huge metal boxes on beaches in Sri Lanka in the late 1990's and in early 2004 and 2005. The discovery of the boxes is detailed in updated previously classified reports from the British government that document sightings of unidentified flying objects by both the military and the general public dating back to the 1950s. Locals all along Sri Lanka's beaches stating "the strange metal boxes appeared suddenly, and after numerous reported UFO sightings." The Zetas concurred with this channeler's message, and expanded upon it to add that this is the reason the pace of the 7 of 10 scenarios seem to be creeping along, not the fast pace originally predicted by the Zetas in the Fall of 2010. Where the boxes may be delaying the 7 of 10 scenarios, the overall schedule will not change. More rapid change will occur, presumably, during the later 7 of 10 scenarios or during the 8 of 10. 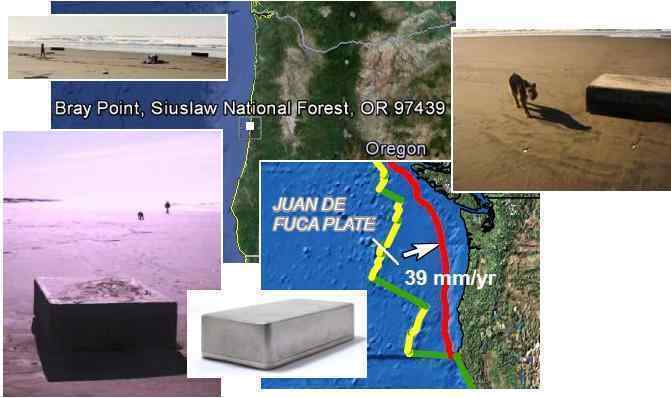 ZetaTalk Explanation 2/18/2012: These sealed metal boxes are indeed alien, placed along significant coastlines to abort sudden and jolting plate movements. The number of boxes discovered by mankind, uncloaked and visible, are a miniscule number compared to the total in use, which range in the thousands. Most are under water. They are supposed to be cloaked, so that humans can look right at them and not see them, but mistakes are made in the rush to place the boxes, on occasion, so some are left visible. Have governments removed them and tried to crack them open? Yes, but the boxes disappear from storage, without a trace. Are they working? If these boxes were discovered on February 6-8, 2012 then they seem to have had an effect on the February 15, 2012 earthquake just off coast from the Oregon beaches. This was a magnitude 6.0 quake, with no ostensible damage in Oregon! The Zetas predicted that Alberto had started a revolution, with amateur photographers everywhere using a filter for light rays in the red spectrum on the increase. ZetaTalk Statement 2/11/2012: The Davos attendees had been complacent, assured that NASA and the USGS would hold the curious back by denying the facts and manipulating the data. They now see that something as simple as the greater visibility of Planet X and its components in the sky can shatter anything NASA states, and prove them to be liars. A simple technique, available to the common man, of using a filter for red to see the complex cannot be stopped, and the cat is now out of the bag. A single individual, such as Alberto, posting red photos on the Pole Shift ning can create a revolution. Has that occurred? And just getting started. A Moon Swirl wafting above the Sun (in the view from Earth) was captured during sunset in both Texas and in Italy, as presented on this Pole Shift ning blog - dual confirmation, again! In addition to photos of the Planet X complex, revealed by red filters, the Looming Venus has become more prevalent, as recently discussed on this Pole Shift ning blog. 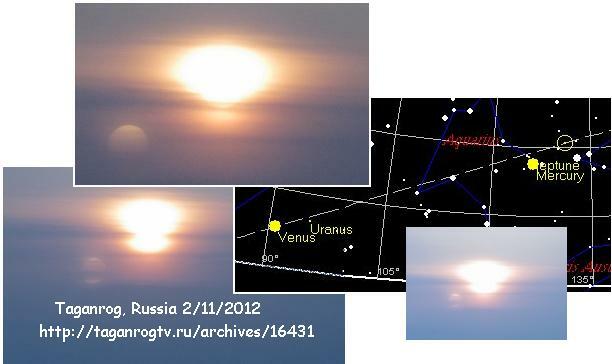 A series of photos from Taganrog, Russia, taken on February 11, 2012 and appearing on Russian TV show the Looming Venus with astonishing clarity. Per reports, Venus is not where expected anymore! I was in Australia a month ago visiting the observatory in Sydney. The staff presenter could not locate Venus in their telescope. Is this because Venus is out of place and caught in the cup with earth Dark Twin? Per the Zetas, Venus will increasingly be seen as a Looming Venus, as it has become squeezed in the cup. ZetaTalk Explanation 2/18/2012: Venus is being squeezed closer to the center of the cup, and can no longer range to the side, being seen in the far East or West by mankind. It will thus increasingly not be seen as the Morning Star, or Evening Star, but as a Monster much closer to the Sun. 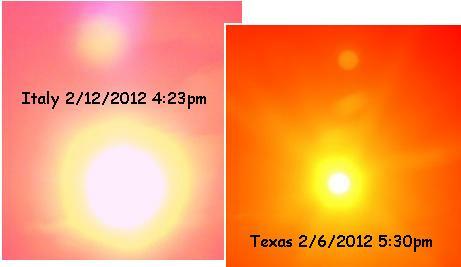 Looming Venus has presented before, on October 29, 2011, confirmed also by the Zetas at that time. But there, last October, it was more in line with the expected position. And at that time, Venus was expected to be closer to the Sun. ZetaTalk Explanation 10/29/2011: This is Venus looming. Venus would stand to the left of the Sun, along the Ecliptic as viewed from the Northern Hemisphere at sundown, all things being normal. But as it is squeezed in the cup with the Earth, in front of the approaching Planet X, it is out of place. Catching the Sun's rays in a blooming effect, where the light rays bend toward Venus from all sides and then continue on this bent path toward Earth, it creates a monster appearance. Since these are not light rays directly from Venus itself, but only light rays deflected by the gravity pull of Venus, and since during sundown the light rays are distorting the Sun's size in any case due to gravity bending over the Earth's horizon, the appearance is varied. Suddenly South Jakarta along with East and West Jakarta in Tangerang are reporting flooding, the media claiming overflowing rivers. But flooding in rivers that cannot drain are not due to rain. This is due to sinking, the sea waters pushing back. Floods as high as 60 inches are still soaking hundreds of homes in the Village Petogogan, Kebayoran Baru, South Jakarta. The rain that occurred in the evening to make the Kampung Melayu, East Jakarta flooded as high as 1 meter. Meanwhile, about 200 homes in Pesanggrahan, South Jakarta, were flooded after a levee breached by limiting the flow of the river reached 20 feet. Floods that hit the city of Tangerang [West Jakarta], Banten, due to the overflow of Cirarap Kali and Kali who is the son Sabi River Cisadane soak as much as 1055 houses in the district of pot. The worst flooding in Housing Total Persada as much as 804 houses with water reaching a height of 2.4 meters, in as many as 201 homes Puradi Housing and the Housing Alamnda rest. 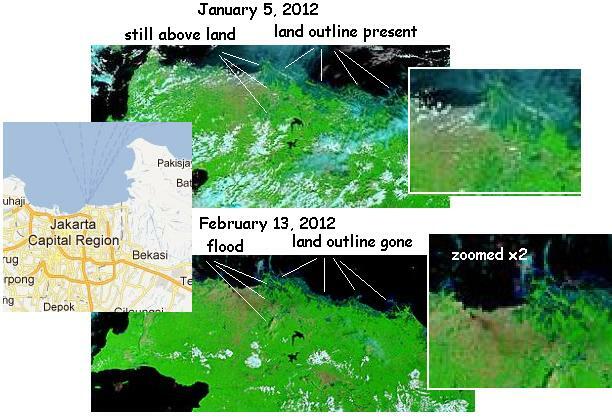 By comparing MODIS satellite images from January 5, 2012 to February 13, 2012 one can clearly see sinking in Jakarta and surrounding environs. Notice the land peninsula and along the coastline to the east of Jakarta, completely sunk from view! And inland regions also, not in Jakarta city proper, now obviously under water. Where the government of Jakarta previously admitted that 70% of North Jakarta was below sea level, South and East and West Jakarta were exempt from such pronouncements. Now these regions are also flooded with waters refusing to drain. This 7 of 10 scenario, scenario 2, the sinking of the Sunda Plate, is approaching its finale. Meanwhile, the Philippine and Mariana plates keep folding, heaping water quite apparent to the east of these folding plates. Buoy 52402 shows sudden heaping, which likely means the Mariana Trench is continuing to close, a silent adjustment in the sea floor deep under in the trench where seismographs are not located. This 7 of 10 scenarios, scenario 3, is approaching its finale too. If Global Warming for sea level issues, and Comet Elenin as Nibiru, and the mass promotion of charismatic 2012 authors have failed, what to do? The establishment is well aware that the ZetaTalk predictions are unfolding, the public becoming increasingly aware of the Earth wobble and signs of the Planet X complex in the skies. The establishment is casting about for fresh approaches. How to replace the popularity of the ZetaTalk site, and the increasingly popular Pole Shift ning? The Extinction Protocol is just the thing, or so they hoped. ZetaTalk Comment 1/28/2012: The Extinction Protocol seems a contradiction - it presents many fact about the Earth changes, yet consistently refuses to focus on those facts that prove the existence of Planet X nearby. Are not the obvious editing lines on the SOHO and Stereo images, the almost daily capture of Moon Swirls and Winged Globes with drifting tails facts? Is not the twisting of the Earth's magnetosphere, as shown on the Magnetic Simulator, a fact? Is not the regularly timed global shuttering, as presented on the live seismographs, indicative of a fact to be considered? Is not the fact that the sunrise and sunset for Europe are too far to the south a fact noted by many? Why are these facts exempt from examination? The site purports to be intelligent and aware, yet consistently ascribed the Earth changes to something other than the obvious - the near presence of Planet X, aka Nibiru. This site was designed by the establishment, to be an attractive alternative to websites such as the popular ZetaTalk and the Pole Shift ning. What does the Extinction Protocol and their fellow disinformation websites point to as the cause of the obvious Earth changes? One excuse is the changing and apparently weakening magnetic field of Earth! The Earth's magnetic field has been going through contortions due to Planet X nearby while the Sun has been virtually asleep during this past solar cycle. But here, the disinformation agents blame a symptom of the presence of Planet X for these contortions, without admitting that Planet X is the cause. What If Earth's Magnetic Poles Flip? Despite an attempt by modern day scientists to explain Earth's past crustal shifts, pole reversals have not and will not happen, per the Zetas. This explanation not only flies in the face of logic and science, it also negates the massive amount of folklore reporting a large flaming object in the sky! ZetaTalk Explanation 7/15/1995: Do the Earth's poles ever suffer a reversal during a pole shift? No. The Earth's polarity, where the magnetic North Pole points consistently in one direction as though focused on a distant point in the Universe, does not change, ever. 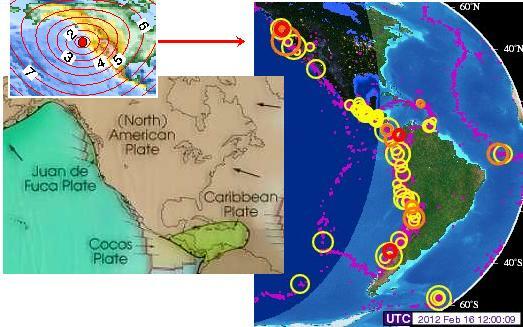 This is an illusion, a hypothesis that humans have concocted to explain what they find in the Earth's crust. Between pole shifts, however, there are slight movements of the magnetic North Pole, especially during the time just before and after a pole shift - approximately a hundred years on either side. Having only the Earth's crust to examine, and being in denial or unaware of pole shifts, a human could only assume that the poles had moved, rather than the crust. Then there was the pronouncement that Venus had slowed in its rotation by 6.5 minutes. Not surprising, in that Venus is caught in the cup in front of Planet X, subjected to all manner of gravitational influences. Scientists studied surface features and discovered that some were displaced by up to 20 km from where they should be given the accepted rotation rate as measured by NASA's Magellan orbiter in the early 1990s. Over its four-year mission, Magellan was able to watch features rotate under the spacecraft, allowing scientists to determine the length of the day on Venus as being equal to 243.0185 Earth days. However, surface features seen by Venus Express some 16 years later could only be lined up with those observed by Magellan if the length of the Venus day is on average 6.5 minutes longer than Magellan measured. Is NASA about to announce the presence of Planet X. Not hardly. It's laying the groundwork for yet another disinformation campaign, per the Zetas. Earth's rotation is slowing down? Ah, must be the Sun, and it happened to Venus too! ZetaTalk Insight 2/18/2012: In 2003, when Planet X zoomed into the inner solar system, the Earth experienced slowing which totaled 37 minutes. This was hidden from the public, due to the cover-up, by periodic adjustments by the Navy, the master clock keeper. When Planet X moved closer to the Sun, this slowing stopped as the Sun was now again the uncontested dictator controlling the Earth's rotation. Why would the scientific community publish such a minor detail as a slowing rotation in Venus, openly, when this is likely to raise yet more questions about what might be in the inner solar system? This is in anticipation of slowing rotation in the Earth returning, to throw confusion over the source of this. Blame the Sun can be expected.